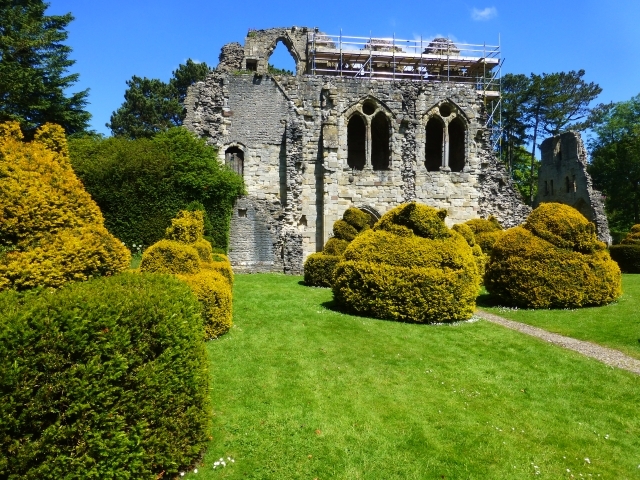 Wander the outskirts of Much Wenlock, and you'll soon come upon the peaceful ruins of Wenlock Priory. The impressive remains we see today were built between the early eleventh to late fifteenth centuries, bu the priory was not the first religious building on this site. That honour goes to a monastery built around 680AD by the Saxon King of Mercia, Meremalh. It was a monastery built for both men and women and according to the customs of the time, it would have had two churches so that monks and nuns worshipped separately. The monk’s church is believed to be placed at the crossing point of Wenlock Priory and the nun’s church at the site of The Parish Church of Holy Trinity. Wenlock's first abbess was the kings eldest daughter, Milburge. During her tenure of around 30 years, Wenlock acquired much land and property. A surviving copy of the “Testament of Milburge”, which she had written just before her death, documents the monastery’s possessions. The history of the monastery is less clear after her death, but it did survive until at least 901 when two nuns from Wenlock witnessed a charter in Shrewsbury. Sometime around 1040, Earl Leofric of Mercia and his wife Lady Godiva founded a minster on the site. This was a college for a group of canons who would serve the religious needs of the surrounding area. Shortly after the Norman Conquest of 1066, King William gave Roger de Montgomery large areas of Sussex and Shropshire as a reward for his support. It was Roger who went on to invite some monks from Cluny Abbey in France to come to Wenlock. 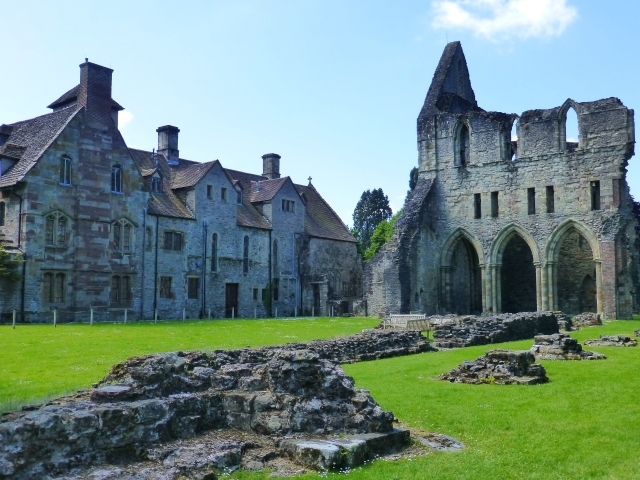 Around 1080 a number of Cluny monks travelled to Wenlock from La Charité sur Loire and Wenlock became a Cluniac Priory dedicated to St. Milburge and St. Michael. A blind woman had her eyesight restored after an all night vigil at the shrine. A drowned boy came back to life. A woman with a wasting illness drank some of the water from the washed bones and vomited a long worm and was cured. Monks who fell from the scaffolding whilst they built the new church didn’t hurt themselves. News of the miracles started to spread and many pilgrims came to Wenlock Priory to visit St. Milburge’s shrine, maybe in the hope to see a miracle or to be the recipients of miraculous healing themselves. They brought gifts and offerings to the saint and, as the number of pilgrims increased from a trickle to a stream, a small town started to develop outside the priory walls. 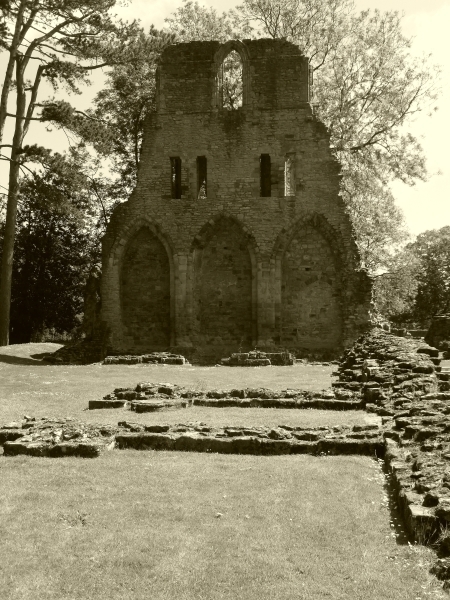 The shrine of St. Milburga was so popular and its financial benefits to the Priory so substantial, that the monks of nearby Shrewsbury Abbey, not wishing to be left out, went off into Wales to get the bones of St. Winifred to try and draw more visitors to their own house. 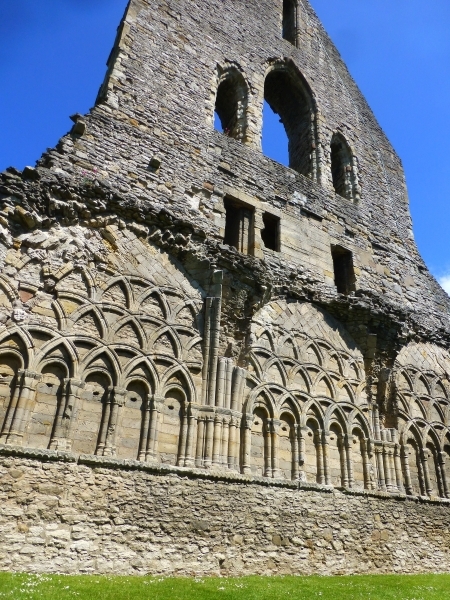 Like all seats of power, the priory had its ups and downs, experiences times of feast and famine. With the influx of pilgrims and a small town growing just outside its boundary wall, its wealth began to grow. In the early 1200’s Prior Humbert started to build a large new church, which may have been the longest and grandest monastic church of the time. It took around 40 years to build and was of the traditional cruciform plan. The monk's choir and high altar were positioned at the eastern end of the church and it is believed that St. Milburga's shrine took up the last two bays behind the altar. King Henry III was a regular visitor to the priory, so often in fact, that he even had his own wine stored in the cellars. The king's stays would often result in gifts or donations to help the priory. By 1272 the unpopular John de Tyford was prior of Wenlock. He had been prior of Bermondsey and had brought that house to financial ruin due to his dealings with money lenders. 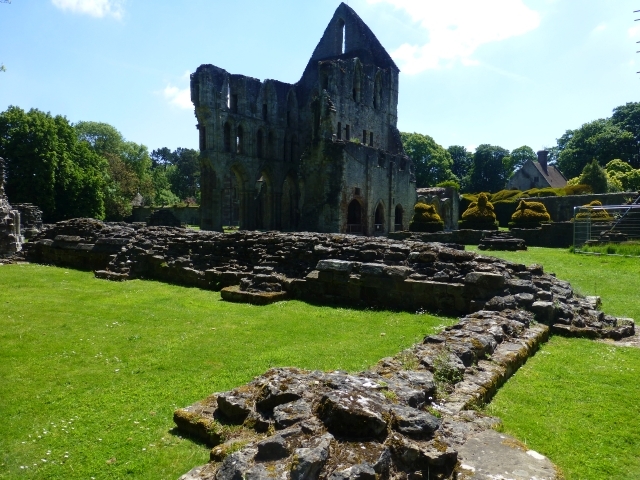 Under his control, Wenlock Priory went into debt and just before he was to be expelled from the house, he sold seven years of wool production in advance and kept the money for himself. One poor monk, William of Broseley, disliked what was happening to the priory so much that he hid in the surrounding forests with a gang of armed men and threatened to kill the prior. Unfortunately, William of Broseley was caught and dealt with. 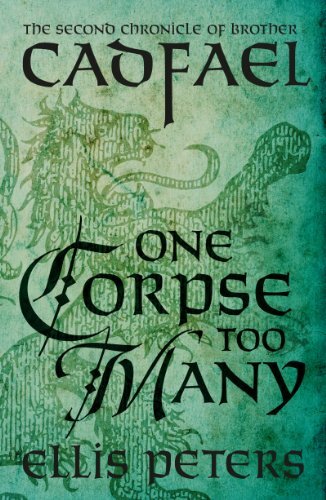 The Worchester Chronicler said “he received what he deserved”. 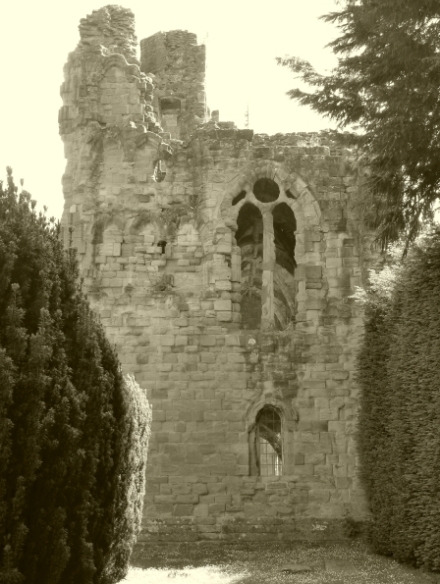 There was more financial trouble for the priory around 1417, when Sir Jon Oldcastle, a former friend of King Henry V who had escaped from the Tower of London came to Wenlock together with criminal William Careswell. They taught the monks how to make fake coins, and were also involved in a plot to kill the King. The priory continued, but between increasing debts and dangerous shenanigans, its reputation as a place for worship, miracles and divine intervention began to decline. In 1521 Dr. John Allen was sent to Wenlock ot help mediate disputes over the appointment of the next prior. 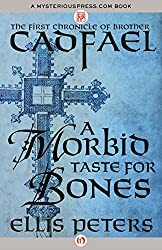 He found a priory in poor health with immorality, easy living, and a lack of worship. Less than 20 years later Wenlock Priory was closed as part of the dissolution of the monasteries. Prior John Bayley and the monks signed their names on the deed of surrender on the 24th January 1540. The prior and senior monks received a pension. Once the surrender was complete the priory was stripped of its valuables. Gold, silver, and jewellery were sent to the Tower of London. 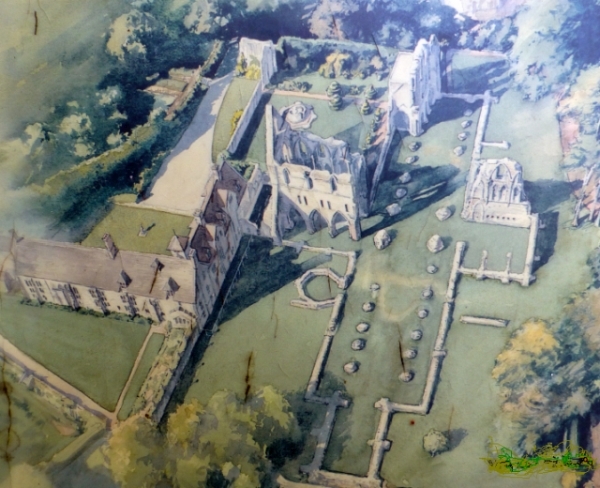 The priory’s estate was given to King Henry VIII’s physician who broke it up and sold it. The priory site and Wenlock land were purchased by the Lawley family who made a home from the prior's lodge and infirmary. The remaining priory buildings were robbed of stone to construct new homes, farm buildings, and walls and the site fell into ruin and conceded to nature. 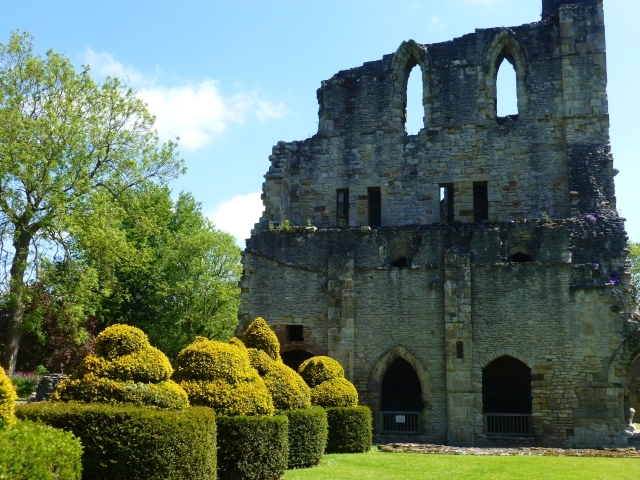 It was a beautiful hot and sunny day when we visited this lovely ruin and it makes a nice day out when you also include exploring Much Wenlock and its link to the modern day Olympics. 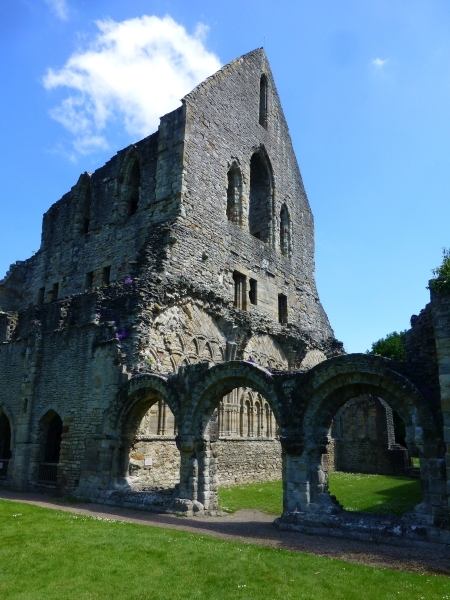 We strongly recommend using the English Heritage free audio guide as it takes you around the priory and explains what you see and tells stories to bring monastic life back to the priory. 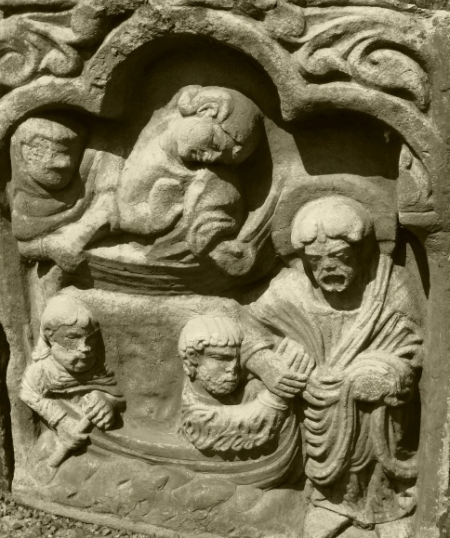 The church was the centrepiece of Cluniac life, which encouraged communal worship. The priory church was 350 feet long, but not much survives now. From the stonework still in the ground you get a sense of its size, and with what survives from the transepts you get some idea of its height. The south transept is the tallest part that remains and stands at over 70 feet high. Built into one wall of this transept is a rare laver which is where the prior would wash the monks’ feet. Unfortunately during our visit the western end of the church was covered in scaffolding to aid the restoration of St. Michaels chapel. This first floor chapel would have been the prior's private chapel and connected to his first floor lodging extending southwards away from the Great West Door. There’s not much left of the priory's cloister, but here the monks would have read, written, prayed, or just contemplated. It was built between the Great West Door and the South Transept with entrances to the church, chapter house, library, and refectory. 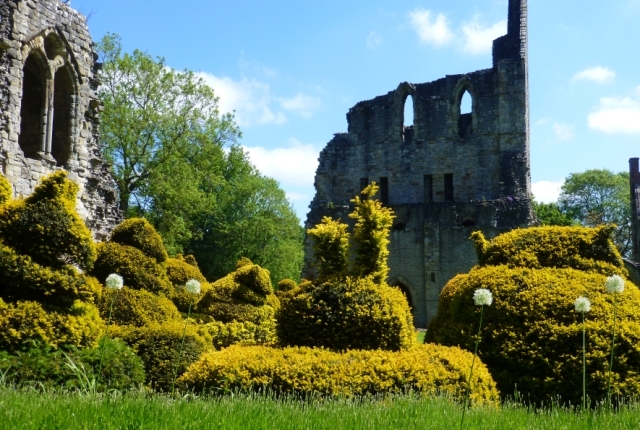 In the late eighteenth century, when it became fashionable to visit old ruins, Wenlock Priory became part of the garden connected to the infirmary/prior's house. Part of this garden is obvious in the cloister area where there are fine topiary and beds of country garden flowers. 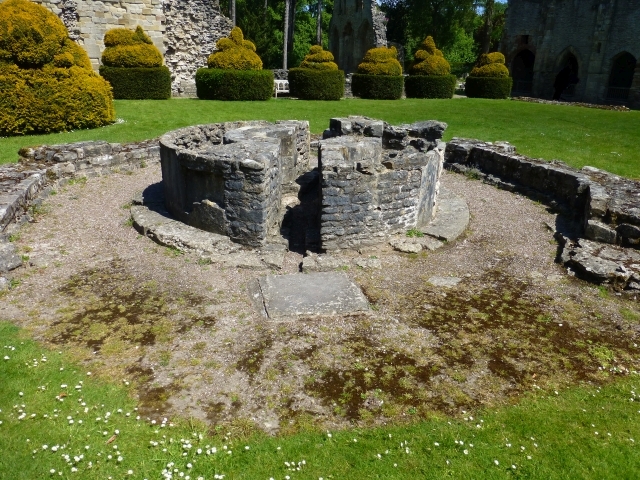 Also within the cloister is the Lavabo, which was an octagonal building containing a rather elaborate water feature in which the monks washed their hands before entering the refectory. In simple terms it was a free-standing fountain with 16 spouts under which the monks washed their hands. 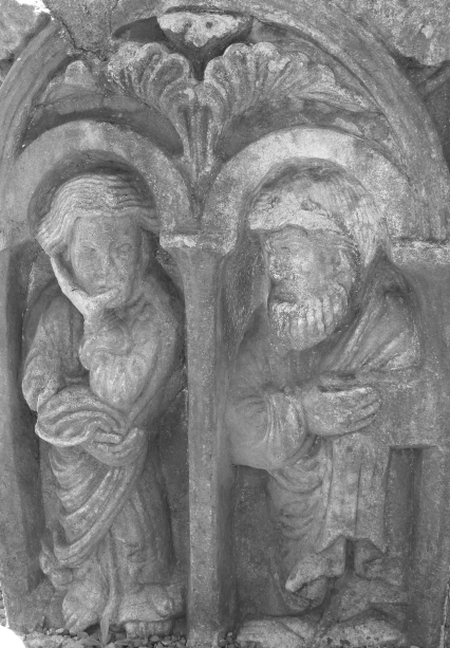 It is rarely seen in English monasteries and this one is probably here because of Wenlock's French Cluniac connection. It is built from local Silurian limestone, also known as Wenlock Marble as it can be highly polished. Around its base are two replica panels depicting scenes from the bible (the originals have been removed to save them from damage). One panel shows John the apostle resting his chin on his hand with another unknown apostle beside him, and the second shows Christ calling to the apostles in their boats on the Sea of Galilee. This room is one part of Wenlock Priory that is from the original building constructed around 1140-50. Its name comes from the ritual of reading a chapter from the Rule of St. Benedict and is where the daily meeting to discuss priory business took place. The entrance to the Chapter House from the cloister is through a beautifully decorated Norman arched doorway, set between two arched windows. 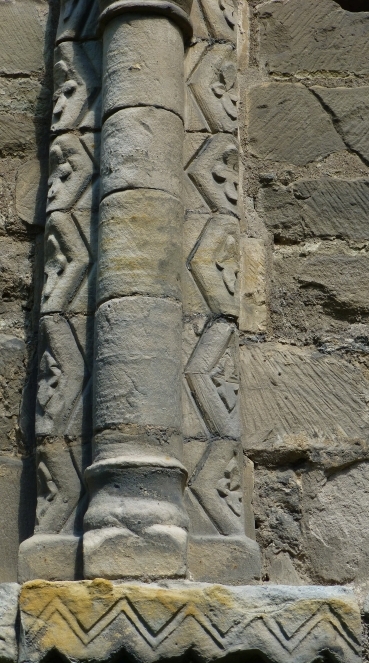 The interior walls have detailed carvings that are typical of Cluniac monasteries. You have to wonder how the church would have looked if this much skill and money was spent decorating the walls in this room. The Infirmary is another part of Wenlock Prior that dates back to the original buildings. At the time this would have been a single storey building where sick, old or frail monks and lay brothers were looked after. Attached to the Infirmary was the Prior's House which was built in the fifteenth century by Prior Richard Singer. This was a lavish building at the time and showed off the status and wealth of Wenlock Priory. After the dissolution of the priory in 1540, the Infirmary and Prior's House were converted into private homes, that exist to this day. If you would like more information on Wenlock Priory, its’ opening times and events please visit the English Heritage website. 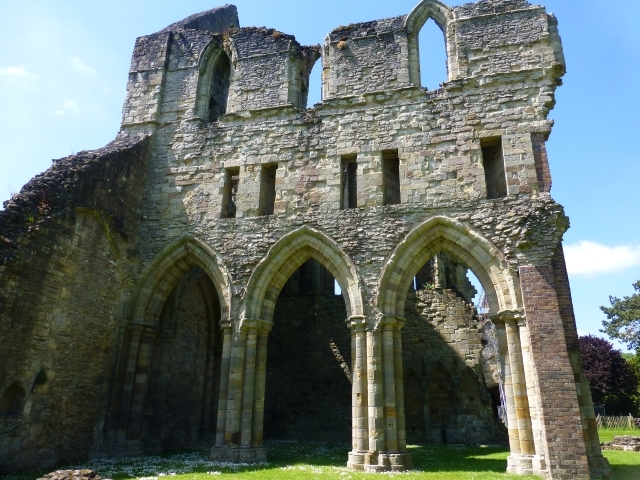 We hope you enjoyed reading about Wenlock Priory. 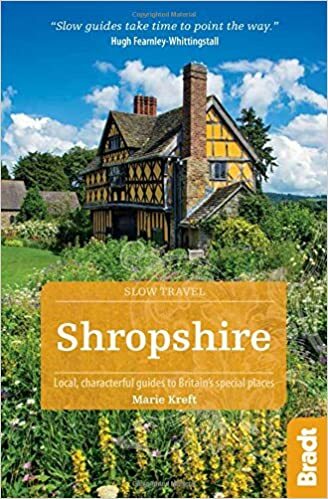 For more information about Much Wenlock, please click here, or check out our Shropshire page for additional information about the other historical sites in the county.